What future does the Church have? How do we imagine it? And what roles do we envisage for women as we do so? Dr Heaney’s lecture will speak about women’s leadership in the Church of the future and the need for creative, courageous and careful thought on this essential dimension of the Church’s life. She will name some of the challenges the theme presents, and potential consequences of failing to do so. Drawing on Scripture, the history of the Church and theological reflection, she will explore insights that might help illumine our way forward. Canapes and complimentary glass of sparkling wine on arrival, followed by a two course dinner with a bottle of red and white wine per table and tea/coffee and cake. 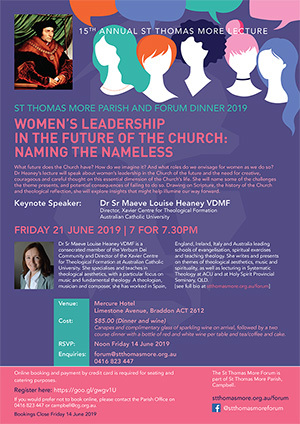 Dr Sr. Maeve Louise Heaney VDMF is a consecrated member of the Verbum Dei Community and Director of the Xavier Centre for Theological Formation at Australian Catholic University. She specializes and teaches in theological aesthetics, with a particular focus on music and fundamental theology. She completed her Bachelor’s in Theology at the Instituto Teológico Verbum Dei, San Pablo Apóstol, in Madrid. In 2004 she completed a Licentiate and Doctorate in Sacred Theology at the Pontifical Gregorian University in Rome, in the area of Fundamental Theology and Theological Aesthetics, where she also taught for two years, as well as at the Rome base of the Catholic University of Dallas. She was the Bannan Fellow at Santa Clara University, California for the academic year 2011-2012, teaching at the Jesuit School of Theology in Berkeley. A theologian, musician and composer, she has worked in Spain, England, Ireland, Italy and Australia leading schools of evangelization, spiritual exercises and teaching theology. She writes and presents on themes of theological aesthetics, music and spirituality, as well as lecturing in Systematic Theology at ACU and at Holy Spirit Provincial Seminary, QLD. Recent publications include Music as Theology: What Music Says about the Word, Princeton Theological Monograph Series (2012), “Mercy, Music, and the Prophetic Voice of Theology: Jon Sobrino’s Extra Pauperes Nulla Salus” in Michael O’Connor, Hyun-Ah Kim and Christina Labriola ed. Music, Theology and Justice (Lanham: Lexington, 2017), “From the Particular to the Universal: Musings of a Woman Theologian” in Catholic Women Speak Network (ed.). Shared Visions: Women Responding to God's Call (Mahwah, NJ: Paulist Press, July 2018) and “New Styles” in Carlos Alberto Moreira Azevedo, Richard Rouse (ed.) Chiesa e compositori; Parole e Suoni (Rome: Aracne editrice, forthcoming). In 2014 she released her 4th CD: Break the Crystal Frame, with Willow Publishing, Australia and is currently working on her next book and CD.